It’s almost that time of year again, time to prepare and send the kids back to school! Amish Originals wants to help you become more studious. Of course we always have something for every room in the home, but this month the teacher has ordered up some fine, handcrafted office furniture to get us all back to work. We have a large selection of office furniture in stock at Amish Originals and recently received a new shipment of open front bookcases. Two “must haves” in your home office for you or your children this year are desks and bookcases. A special offer only for our e-news members, receive 20% off on a desk chair with the purchase of a desk now through August 15th, 2012. These along with all our pieces are made to order and can be customized to fit your needs. Choose your own wood, color, finish, and even hardware options! Want to get a look at some of the options we have available to you? 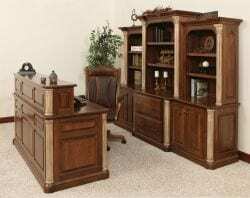 Browse our best in class office furniture section here then take a hall pass and get to Amish Originals to order yours now!